Since 2013, I have written several pieces evaluating the way that a particular team has filled a particular position over the past several decades. You can see them in the sidebar at the right. While front offices change, managers and field personnel change, and the game itself changes, I find these deep dives fascinating, and hope that you do as well. 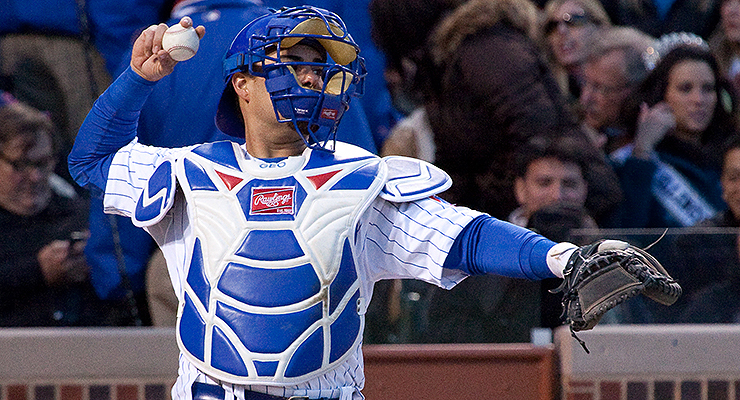 Pop quiz: who is the best homegrown Chicago Cubs catcher since World War II? You would be forgiven for missing this one. The answer is probably Rick Wilkins, who played 455 games from 1991 to 1995, and who amassed 11.6 WAR in a Cubs uniform largely thanks to his fluky 1993 season, when he came out of nowhere to hit 30 homers and collect 6.7 WAR. He didn’t even get an All-Star nod or a single 10th-place MVP vote for his troubles. So even North Side diehards should feel no shame in not knowing that he’s the best backstop the Cubs farm system has produced in the last 70 years. That isn’t every player who played an inning behind the dish for Chicago; it’s just the players who played significant innings in at least one season. As in my Mets case study, I generally defined that as at least 10 starts in a year in which no one started 100 games as catcher, or at least 20 starts in a year in which one player started at least 100 games behind the plate. The thing is, while the Cubs have rarely had elite talent behind the dish, they’ve generally managed to get at least adequate production. Their platoons have usually served to get them somewhere between two and three team wins at the position, which is really impressive: it’s a far better track record than Cleveland achieved with their first base platoons, despite the fact that first base should be an easier position to fill. Obviously, some of that discrepancy is accounted for in the WAR calculation, where a positional adjustment is applied to account for precisely that type of positional scarcity. Still, the contrast is clear: while Cleveland too often populated their first base platoons with negative-value talent like Casey Kotchman and Matt LaPorta, the Cubs typically managed to find backup backstops who were capable of contributing positive value in their limited playing time. Savvy drafting is a big part of the answer. I looked at the 20 Cubs with the most games played behind the dish over the past 37 seasons. Other than Rule 5 pick Davis, three of the top four were Cubs draftees: fifth-rounder Joe Girardi, 11th-rounder Geovany Soto, and 23rd-rounder Rick Wilkins. Welington Castillo, seventh in games played, signed as an amateur free agent at the age of 17; Hector Villanueva, 12th on the list, signed as an amateur at the age of 20. Finally, Damon Berryhill, eighth on the list, was taken with the fourth overall pick in the 1984 January draft. (That sounds far more impressive than actually it is. The January draft mainly focused on junior college players, had far less talent than the June draft, and ended in 1986.) All of these players, many of whom were low-round draftees, settled in as decent backup catchers with the occasional good year as a starter, and all were acquired at a relatively low cost. Other catchers came via trade. Miguel Montero (10th-most) came over in 2014 in return for two minor leaguers who have not done much of anything in the majors. (His true cost was his inflated salary, as the Cubs took on more than half of the five-year, $60 million contract the Diamondbacks foolishly handed him in 2012.) Damian Miller (18th-most) came in 2002 for two minor leaguers who never made it to the Show at all. They got Steve Lake (11th-most) in 1983 for a PTBNL named Rich Buonantony, who never made the majors, and they got Paul Bako (17th-most) in 2002 for a PTBNL named Ryan Gripp who never made the majors. A number of the swaps were challenge trades, catcher for catcher. In 1995, the Cubs traded Rick Wilkins (fourth-most games played) to the Astros for Luis Gonzalez — yes, THAT Luis Gonzalez — and Scott Servais, who had the sixth-most games played. After acquiring Damian Miller in 2002, they flipped him to the A’s in 2003 for Michael Barrett, who had the fifth-most games played for the team. Of course, he then got into a fistfight with Carlos Zambrano in 2007, and wound up being hastily traded to the Padres for a backstop named Rob Bowen shortly thereafter. Bowen only played 10 games in a Cub uniform, but you can’t expect to get a lot back when you’re dumping a guy because he punched your best pitcher. The rest were free agents, just like countless other journeyman backstops, and their ranks fill the back half of the list: Henry Blanco (ninth), Todd Hundley (13th), Tim Blackwell (14th), Jeff Reed (15th), David Ross (16th), Paul Bako (17th), Benito Santiago (19th) and Dioner Navarro (20th). With one exception, none cost very much. Their most expensive free agent signing was Todd Hundley, who got a four-year, $24 million contract in 2000, and then played poorly before being salary-dumped on the Dodgers two years later. He was the only real marquee catcher the Cubs signed as a free agent. If the past four decades are any guide, he is likely to remain so for a while. So here’s how it happened. The starting catcher in 1980 was Tim Blackwell, a free agent signing in 1978 who mainly backed up Dave Rader in 1978 and Barry Foote in 1979. In 1980 he got the bulk of the playing time and made the most of it, posting a .745 OPS more than a hundred points higher than his career average, hitting five of his six career homers. His defensive stats that year were similarly apparently excellent; somehow, he posted 3.0 WAR that year, which is truly extraordinary for an otherwise career backup who produced a combined -1.2 WAR in his other eight seasons in the majors. But Blackwell’s magical 1980 was a harbinger of what would follow. In 1981, Blackwell split time with Jody Davis. A Mets draftee, Davis was traded to the Cardinals for Ray Searage (currently the Pirates pitching coach) in 1979 after enjoying an extraordinary year, hitting .296/.382/.513 with 21 homers as a 22-year-old in Double-A. But he took a step backward in 1980, the Cardinals left him unprotected in the draft, and the Cubs had the opportunity to get a franchise catcher nearly for free. During his rookie year of 1981, he more or less repeated the so-so batting line he’d posted in the minors the previous year; in 1982, he took the starting job for good, posted a three-win season, and over the next five years he was good for about 20 homers and two to four wins every year. But 1987, his age 30 season, was his worst year since his debut, and in 1988 he split time with Damon Berryhill. The Cubs unceremoniously flipped Davis to Atlanta for pitching prospects just before the end of the season, but again: he’s the best Cubs catcher since World War II. Berryhill was the starter in 1989, with Girardi as his primary backup, but he had rotator cuff surgery and missed much of 1990, so Girardi took the lion’s share of playing time. Still, the committees kept the team’s overall backstop production around two wins a year in 1988 and 1989, with a dip to 1.3 wins in 1990. Rick Wilkins came up from the minors in 1991, sharing time fairly evenly with Hector Villanueva, who had backed up Girardi the previous year. Wilkins split time fairly evenly with Girardi in 1992, and again, the men combined for roughly two wins each year. Then, in 1993, Wilkins went out of his mind, bashed 30 homers, and posted a 6.7 win season that was at least as unlikely as Tim Blackwell’s incredible 1980 campaign. Wilkins fell back to earth in 1994, but backup Mark Parent picked up some of the slack, and the team got its customary two wins from the position. As they had with Davis, the Cubs cashed in Wilkins in a midseason trade in 1995, acquiring Gonzalez and Servais. Gonzalez played a couple of fine years in the Cubs outfield, but Servais’ best year in a Cubs uniform — in fact, by WAR, the best year of his career — was the 52 games he played immediately after the trade in the second half of 1995, posting two WAR to complement the 0.9 WAR Wilkins had banked before he departed. Servais played a little worse but still decently the next year, as the platoon declined from its 3-win 1995 to a 2-win 1996. Then, toward the end of the decade, the pixie dust ran out. In five out of seven seasons 1997 to 2003, the Cubs failed to get even one win from their catchers. Servais played poorly in 1997 and 1998; in 1999, an aging Benito Santiago was just as bad. The one good year in the period was 2000, when 35-year-old Girardi came back after winning three rings with the 1996-1999 Yankees, and had the best year of his career, posting an unlikely 1.7 WAR in 106 games. But he fell back to earth in 2001 and 2002, and so did the platoon’s performance, as expensive free agent disaster Hundley struggled and frequently failed to keep his bat above the Mendoza Line. The starter in 2003 was Damian Miller, who like Santiago and Hundley proceeded to have one of the worst years of his career. Fortunately, help was on the way. The Cubs had gotten Miller from the Diamondbacks in 2002, and in December 2003, they shipped him to the A’s in exchange for Michael Barrett, a player the A’s had themselves acquired just a week earlier for a PTBNL. The Cubs then non-tendered Barrett and signed him as a free agent, to be able to get him for less money than he would otherwise have been in line to receive, as an arbitration-eligible veteran. It may have been hard to swallow for Barrett, then 27 and having been the starting catcher in Montreal for most of the previous five seasons. But he was coming off a campaign in which he hit .208 and was clearly available on the cheap. It all worked out for the Cubs in the end, as it so often did. Barrett was their most consistent catcher since Davis, and in 2004, 2005, and 2006, he was worth two to three wins every year. He was bad in 2007 even before the fateful fisticuffs, though, and the team had to swallow negative production from catcher that year. But one year later, all was righted, as Geovany Soto came up for his rookie year and won the Rookie of the Year award. 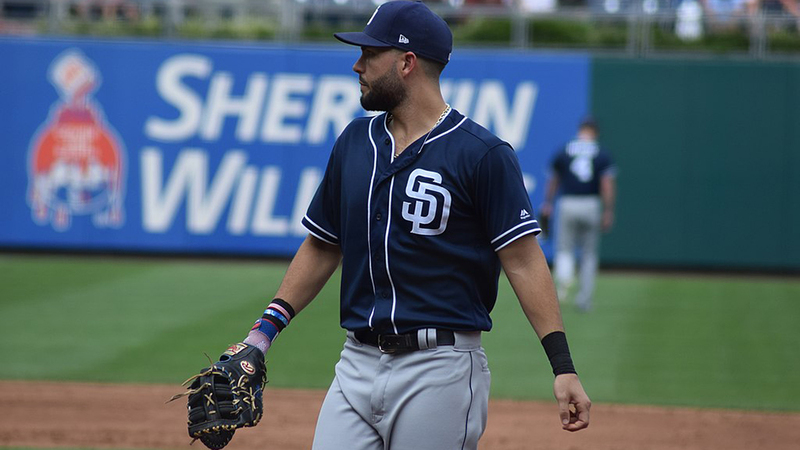 It turned out to be the best year of his career, as he set career highs in nearly everything including plate appearances and games played and earned his only All-Star nod. His bat paced the team to earn four wins from catcher in 2008, and after a dip in 2009 when the the Cubs got only 1.5 wins from the position, he had a very good 2010, bringing the team back to 3 wins. The only trouble was his main backup, Koyie Hill. Hill signed as a free agent in 2006 and received at-bats from 2007-2012. Other than 2009, Soto’s tough sophomore season, Hill was worth negative WAR every single year. Unlike Cleveland, a team that constantly endured negative performances from its backup first basemen, Chicago largely managed to avoid it — until Hill. He was a big reason why the team got only 1.3 wins at catcher in 2011, despite a 2-win performance from Soto that year. It was even worse in 2012, as Soto’s inconsistent bat went away again. The Cubs traded Soto to Texas in a deadline deal (as they had with Wilkins), but the second half provided no relief, and they wound up with just 0.3 wins at catcher. As usual, though, the team would not remain down and out for long. The next starter was Welington Castillo, who had performed well in limited action in 2012. He split time with Dioner Navarro in 2013, and both were brilliant, leading the team to 5.3 wins at catcher. Castillo remained good in 2014, but his main backup, John Baker, was horrible, pulling the team’s performance down to just 1.3 wins. In 2015, the main catcher was Miguel Montero, an overpaid but effective veteran catcher. He was worth two wins by himself; the booming bat of rookie Kyle Schwarber, who could rake but whom no one expected to stay behind the dish, was worth another two, giving the team four wins overall. Montero hit very poorly in 2016, but it didn’t much matter, as two newcomers predictably picked up the slack: Willson Contreras, whom they’d signed as an amateur in 2009, and free agent David Ross. Contreras produced just over two wins and Ross just under two wins. In all, the team got 3.5 WAR at catcher in 2016. And even though Ross announced his retirement at the end of the year, it’s hard to doubt that the Cubs will figure something out in 2017. I wanted to look at Chicago’s catching situation because the Cubs have picked a strategy that I wouldn’t have expected to work. Their approach to catcher, filling the position almost exclusively with a mixture of cheaply acquired backups and draftees, backfired fairly often at first base in Cleveland, and not infrequently at third base in Minnesota, but yielded consistent dividends in Chicago. This could be a simple illustration of inequality in baseball: the Cubs were better able to overcome their expensive mistake on Todd Hundley and their expensive investment in Miguel Montero because they have a lot more money to play with. But both Hundley and Montero came in the last 15 years. For most of the two decades before that, the Cubs achieved genuine year-in, year-out success on the cheap. A lot of that was luck, getting Davis in the Rule 5 draft. The most striking thing about the spiral of ineffectiveness that plagued many of their teams around the turn of the millennium was that it was the only time in the last 37 years that they failed to find a solution at catcher for multiple years in a row. Their attempt to buy their way out of their troubles by acquiring Hundley backfired on them, but that experience also stands out for its rarity. The rest of the time, they always figured out a cheap way to call someone up or bring someone over and get one of the best years of their career. Clearly, players love playing in Wrigley Field. It’s a great hitter’s park (except when the wind is blowing straight in), and some of these players’ rejuvenation may be owed to the fact that they got to trade their previous home park for the Friendly Confines. And it is possible that Chicago’s player evaluation personnel have been unusually effective in identifying precisely the players who are most likely to thrive on the North Side. But perhaps the most important insight is this: Catcher is a position at which there are very few stars, and very many easy-to-acquire veterans who are just slightly above replacement level. Given that reality, it makes little sense to try to buy a star, when you could just buy a bunch of cheap catchers and see if any of them has a fluke career year in him. There will always be a Paul Bako, or a Henry Blanco, or a David Ross who can be had for a couple million dollars. No matter how rich your team is, it may make sense to avoid spending the big bucks on catcher. That is fascinating — thank you so much! “The gold glove center fielder who can mash is not going to play first” — Darin Erstad did, and Ian Desmond will! More broadly, it should be easier to find players at the extreme left of the defensive spectrum than at the extreme right of the defensive spectrum. It is extraordinarily surprising to find that Chicago and Cleveland had such opposite experiences. Enjoyable read. Alex, I encourage you to use your analytical skills and scribe a differential on how the White Sox filled the receiver position over the same or older-sample era with a buzz-point on possible measurable effects of day baseball (the first Wrigley Field daygame was August 9, 1988) on catcher longevity/production. I think you mean that was the first Wrigley Field night game! This was superb, thank you for your work. Glad LSR brought him up, but how did you neglect to even mention Randy Hundley, Alex? Not homegrown, but a huge positive for the Bruins for several years who Leo seemingly tried to kill with 150+ games a year. Hardly fair to name a catcher from 1935 as ‘the best’. But Gabby Harnett hit the Homer in the Gloamin’!